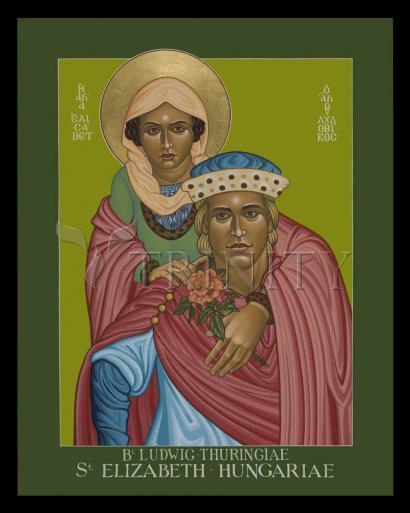 This married couple was rare in the annals of saints. Their passionate love was renowned, yet this worldly love blossomed into sacred love. Both were born of royal lines, Elizabeth in 1207 and Ludwig (Louis) in 1200. Married life could have been rocky, as his mother and sister hated her. She lived with much mocking and insults. As their life progressed, she worried that her love for him was too intense; perhaps that kind of love should be reserved for God alone. She found natural love and love of God compatible, and plenty of love left to share with the poor. Both were considered very attractive, but distinguished by purity of soul and dedicated to justice and service to God. Although he traveled much, she found solace in the belief that the best marriages survived with an angel as a messenger between the two. Her work led to an interest in St. Francis of Assisi, her contemporary, and she became the first German Third Order Franciscan in 1221. In 1225, Francis sent her one of his cloaks in thanks for her work with the Order. Ludwig died of a fever when sent to war in 1227, and she was devastated. His family turned against her again, throwing her and her 3 children onto the streets. She continued to serve the poor, sick and lepers until her death at age 24 in 1231. In this icon they embrace, a rose as a symbol of their love. The rose also represents Mary and Christ, the beauty she found in the world, and paradise where they would live together in praise of their God. In the collar of her dress there is the Tau, the Greek letter St. Francis chose as the symbol of God and of his Order. Her feast day is November 17. His death: September 11. Elizabeth was a princess and the daughter of King Andrew II of Hungary. She was the Great-aunt of Saint Elizabeth of Portugal. She married Prince Louis of Thuringia at age 13. She built a hospital at the foot of the mountain on which her castle stood and tended to the sick herself. Her family and courtiers opposed this, but she insisted she could only follow Christ's teachings, not theirs. Once when she was taking food to the poor and sick, Prince Louis stopped her and looked under her mantle to see what she was carrying; the food had been miraculously changed to roses. Upon Louis' death, Elizabeth sold all that she had, and worked to support her three children. Her gifts of bread to the poor, and of a large gift of grain to a famine stricken Germany, led to her patronage of bakers and related fields.